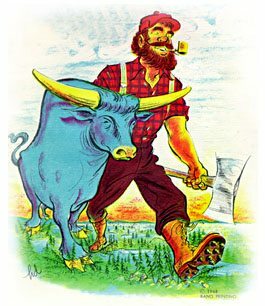 Paul Bunyan: "PETA will exterminate Babe over my dead body!" Nabiscuit, owner of Humbug's Animal Crackers, under pressure from the People for the Extermination of Animals (PETA), has done “the unthinkable,” Greg Shee Ann, the Acting Director of the United States Fish and Wildlife Service, whined. The company acknowledged it has released the wild animals shown on its animal crackers' familiar red-and-yellow package. “They're no longer caged,” spokesperson Con Mann said. The red-and-yellow box is the same, except that it shows wild animals on the loose. PETA Executive Vice President Tracy Rei-Mann is “happy” that her organization was successful in bullying a major food manufacturer into “complying with our demands,” as it will make the control (a euphemism for “extermination”) of wild animals all that much easier. “Poachers and hunters are overjoyed, too,” she said. Critics contend the package redesign is “just another Nabiscuit gimmick,' citing the company's 1995 “endangered species [cookie] collection,” a percentage of the proceeds of which went to the World Wildlife Fund and its 1997 “zoo collection,” some of the profits for which were funneled to the American Zoo and Aquarium Association. Note: No animals, wild or domestic, were hurt in the writing of this article, except for the author's cat, Tigress, who happened to switch her tail under the rocker of the writer's rocking chair while the chair, unfortunately, was on the downstroke. Tigress went promptly to the vet, who pronounced her “fit as a fiddle,” whatever that means.